Peace and serenity are available 24/7 thanks to the luxurious Stressless Capri (M) recliner. Its wide contours, tantalizing cushions, and generous proportions make this recliner the perfect addition to any home. The built-in Stressless Plus and Glide systems are in tune to your movement and adjust with you to the most comfortable position. 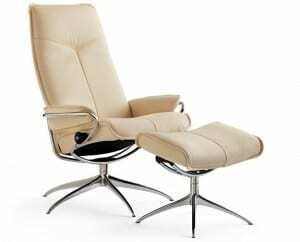 No other series of recliners are as advanced or aware of your every move like Stressless. The matching ottoman invites head to toe comfort with soft padding to relax your legs. The 360 swivel allows you to adjust your view with ease. The Stressless Capri (M) recliner is not only a beautiful addition to your home, it offers unrivaled support where you need it most. It’s ample size and plush cushioning invite instant relaxation and support where your body needs it most. The internal patented Plus and Glide systems respond to shifting weight and adjusts support to ensure your neck and back are in alignment. The shiny 360 swivel allows you to effortlessly change your view with ease. The matching ottoman supports your legs and feet so you can relax in total comfort. 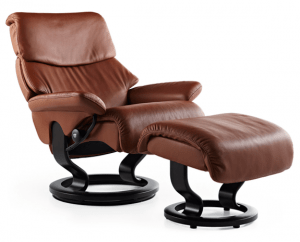 Stressless Capri (M) recliners are built with high-quality parts and materials direct from Norway. When you work hard all day, you’ll look forward to relaxing in peace and serenity thanks to the Stressless Capri (M) recliner. Kick back and relax knowing you’ve selected an ergonomically supportive recliner to support your current and future well-being. With a name like Stressless, you’re guaranteed quality now and for years to come. We ship to any address in all 50 United States. Ask for details regarding shipments to Canada. For quality assurance, all Capri (M) shipments must be insured for accident, loss, or damage. Once your shipment leaves our facility, a tracking number is provided via email. Unless otherwise stated, delivery means “to your door”. Shipments must be signed for by someone over 18 years of age.